Krang sends Shredder, Rocksteady and Bebop up to the Earth’s surface to steal “Compound X-7”, an anti-mutagen that Krang believes will reverse the effects of mutagen on the Turtles and turn them back into baby Turtles. Unable to locate Compound C-7, Rocksteady and Bebop decide to trash the place and throw a barrel filled with some unknown substance out the window where it lands on two unsuspecting Garbage Men. Meanwhile, April contacts the Turtles with a tip on an attempted break-in at Tropotron Labs. The TMNT head there and encounter (and foil) Shredder and company. The bad dudes manage to escape thanks to a smoke bomb, as a Channel Six News team arrives to film the Turtles in a coughing fit. 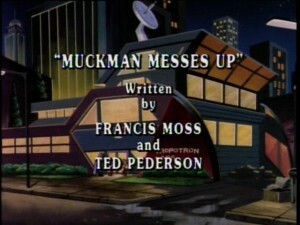 Later, the two Garbage Men who have mutated into something horrible, have renamed themselves Muckman and Joe Eyeball. The pair vow revenge against the Turtles after they see the Channel Six News report on the break-in at Tropotron Labs. April and Irma scour the city in search of the two missing Garbage Men. When they find their garbage truck, the reporters contact the Turtles, only to find themselves face-to-face with Muckman and Joe Eyeball. The Turtles track April and Irma to the alley behind Tropotron Labs but as soon as they get close to the two new mutants in town, they suddenly become very weak. In their weakened state, the Turtles are unable to save April and Irma and they are carried off by Muckman and Joe Eyeball. Elsewhere, Shredder, Rocksteady and Bebop have returned to the Earth’s surface to locate Muckman and Joe Eyeball. It seems that Krang has an interest in them as well. Back at the Turtles’ Lair, Donatello discovers the reason that he and his brothers were weakened by the presence of Muckman and Joe Eyeball. Donny decides that he can develop an antidote, but he must return to Tropotron Labs and get a sample of the mutagen that created the menacing muties. The other Turtles, along with Splinter, track down April and Irma in an effort to save them. However, they all arrive at the same time and place to discover that Muckman and Joe Eyball have teamed up with Shredder, Rocksteady and Bebop. As soon as Muckman and Joe Eyeball get close, the Turtles collapse. Splinter is taken prisoner by Shredder who prepares to return to the Technodrome. Shred-head leaves the unconscious Turtles to Muckman and Joe Eyeball. April and Irma save the Turtles by convincing Muckman and Joe Eyeball to watch the Tropotron Labs security camera videotape of Shredder, Rocksteady and Bebop breaking into the lab and throwing the mutagen onto the Garbage Men. Muckman and Joy Eyeball help Donatello concoct an antidote that prevents The Turtles from being affected by the mutagen and then help them rescue Splinter from Krang and Shredder.